PARIS, December 12, 2017: French Justice Minister Ms Nicole Belloubet on Tuesday (December 12, 2017) handed Freedom Network, a Pakistani civic liberties organization working on issues of freedom of expression, media freedoms and safety of journalists, France’s prestigious Human Rights Prize. The prize, which was set up in 1988, is awarded in recognition of the excellence and impact of the recipient’s work. 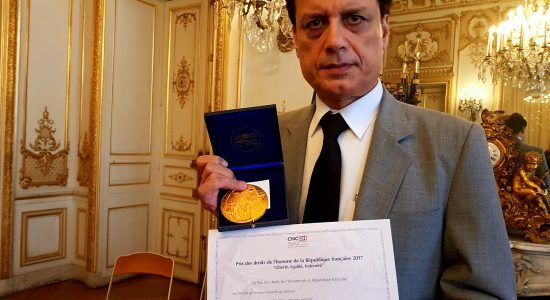 The award was given at a glittering ceremony in Paris attended by Qamar Bashir, press consular at Pakistan Embassy in Paris, French government officials, and national and international civil society organizations, including Reporters Sans Frontieres, the Paris-based international media rights watchdog. “The award of this Prize is an honor for Freedom Network and essentially constitutes recognition of the struggle by Pakistani journalists, media and civil society for the defense and promotion of freedom of information, freedom of the press and journalism in Pakistan,” said Iqbal Khattak, the Executive Director of the Islamabad-based Freedom Network in remarks after receiving the prize. 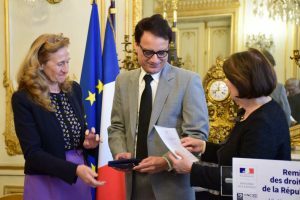 “I dedicate this award to all those journalists, media workers, bloggers and human rights and civil society activists in Pakistan who have either sacrificed their lives or continue to face myriad pressures to uphold these fundamental freedoms,” he said, adding that the French Republic’s Human Rights Prize would inspire persistence in keeping alive the struggle for upholding freedom of expression in Pakistan. “The Constitution of Pakistan guarantees freedom of expression and right to information but as the country struggles with its turbulent political transitions and empowerment of citizens, it is grappling with serious impediments such as attacks against journalists from various threat actors and censorship and curbs that citizens and bloggers face online from controversial laws and executive authorities,” Khattak said. “The biggest challenge that Pakistani media practitioners face is impunity for crimes against journalists and online information practitioners. At least 120 media practitioners have been killed in the country since the year 2000 but only two of these fallen information heroes have received justice. Dozens of online information practitioners are facing legal action for expressing dissent,” he said. “Attacks against journalists and information practitioners is not merely an attack on them for their journalism or opinion, but an attack on freedom of expression. If journalists and information practitioners remain unsafe, media and society cannot be free. And without media freedoms there cannot be democracy,” Khattak added. Established in May 2013, Freedom Network is Pakistan’s first media watchdog organization monitoring attacks on journalists and other information practitioners. It undertakes research, advocacy and capacity building on protections of freedom of expression and assisting journalists and other information practitioners. Many many congratulations ,, matter of proud for us .